This afternoon, bailiffs physically dragged out several protesters at Greenwich House, all of whom were from Zero Carbon Society, and ordered students to leave the premises within the next ten minutes. Bailiffs arrived at Greenwich House shortly before 5pm, following a hearing at 2:30pm at which a court judge ruled that the University of Cambridge could evict students from the property following a seven-day occupation. A University spokesperson said: “The occupation of Greenwich House caused significant disruption both to the University staff who work there, and to the vital work they carry out to support research and teaching across the university. Crowded in the canteen of the central administrative building, several occupiers were initially seated in the middle of the room chanting and refusing to leave, surrounded by at least eight bailiffs from the High Court, who had blocked both entrances. Around five students voluntarily left the occupation when bailiffs arrived, while around seven students remained inside of Greenwich House. The occupation of Greenwich House – a University administrative building which houses its research operations, finance, and public relations offices – entered its seventh day today. 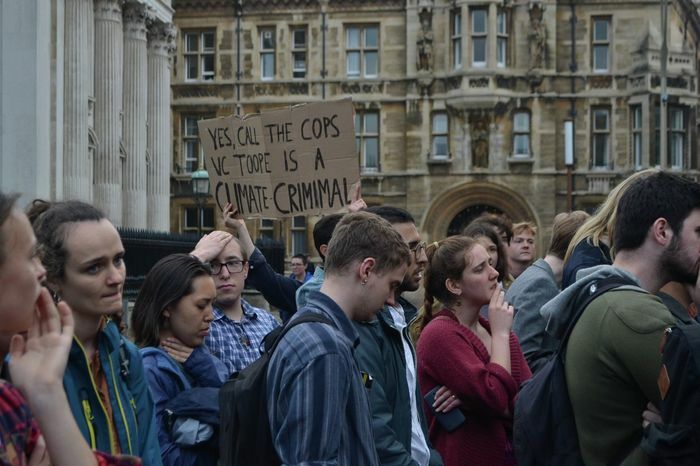 Occupiers had previously vowed that they would continue the occupation until the University agreed to the demands of “immediate commitment to full divestment from fossil fuels by the year 2022”, and that no disciplinary action be taken against students involved. The University has not yet said whether it plans to pursue disciplinary action against the organisers of, or participants in, the occupation.